Includes 15 foot replaceable cable. The leg mount remote control is an essential accessory for the steeler. Designed to clamp on a standard leg (13/16") it utilizes a spring mount with padded foam to tightly bind to the leg preventing slippage while preventing damage. Switch from Gain 1 to Gain 2 for two channel switching. The unique overdrive limiter function gives you an additional tone preset that you can combine with the mode and boost functions. 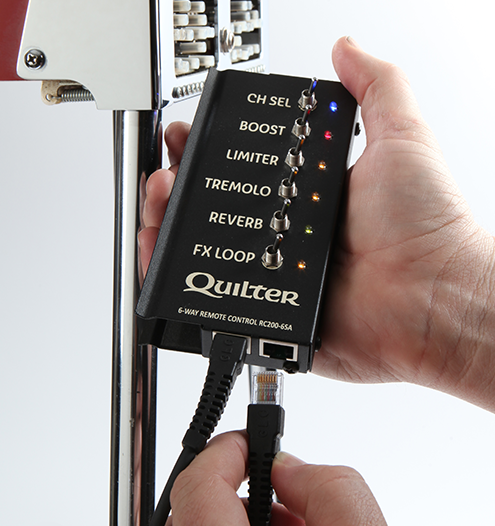 Activate the tremolo from the foot controller whenever you need this classic effect. Reverb can be activeted with the foot controller. The effects loop works with effects pedals which can be powered and stowed remotely via the Steelaire onboard 9 VDC jack.